During our stops we dined in some wonderful restaurants and stayed in some snazzy hotels that made big impressions on us. As a result the O.Henry’s sheets’ thread counts are about to double and the flavors and service at our restaurants will be forever enhanced by our expanded frame of reference. In June our chefs, general managers and key team members took a field trip to the Goat Lady Dairy where we spent the day harvesting Sweet 100 Tomatoes (we popped a few down, still warm from the sun, while we were picking – they taste like candy), new potatoes, patty-pan squash, blueberries and other deliciously fresh fruits and vegetables. We then spent the evening cooking and indulging in the incredible flavors that result when you eat food that fresh. On this amazing day our team got the chance to share ideas about our exciting, experimental plans to bring even more flavorful, seasonal foods to our restaurants, via our “Field Truck. We have long believed that the “nearer the farm to the fork the better the flavor.” Over the past three years we’ve developed relationships with area farmers so we can purchase fresher food locally. We’re thrilled that, in the process of figuring out how to bring the most naturally flavorful food to our guests, we’re also supporting sustainable agriculture and our community’s farming economy. Years ago restaurateurs planned the day’s menu based on produce harvested that very morning. Local farmers would bring their fruits and vegetables to town then go from restaurant to restaurant offering their selections. Now it’s not quite so simple (and maybe it ought to be) because most produce is grown on huge farms. We don’t know them and they don’t know us, and often the flavors are mediocre. We couldn’t find a contemporary model that addresses the issues involved when purchasing and distributing local produce for a restaurant outfit like ours (and we had our friend, Susan Andreatta from the UNCG Anthropology Department, help us look), so we decided to invent one. Thus the “Field Truck” initiative, which includes everything from planning crops with the farmers, to picking up and delivering produce. We’re also modifying and developing recipes so we can take advantage of the changing seasons’ bounty and some experimental crops. We’re discovering how to deal with the inevitable challenges that arise when trying something new. For example, during the drought tomatoes have been hurt. We adapted. Along with our partner farmers, we’ve done some scrambling to make sure we had enough tasty tomatoes for all five of our restaurants. And “tasty” is the operative word because we’re committed to serving only tomatoes that taste like tomatoes, squash that tastes like squash and corn that tastes like corn. Local, seasonal vegetables are the key to gaining this flavor advantage, so, come February, if we don’t have tomato slices on our sandwiches you’ll know why – we’re holding out for the real thing. Using only seasonal produce has lead us to experiment with a few ingredients we haven’t used very often. If the recipes we’re working on now work out, our upcoming menus may feature sweet Chiogga beets, also known as candy-cane beets because of their stripes; Japanese turnips, thin-skinned golf-ball sized turnips, delicious when lightly seasoned and roasted; and Parisian carrots because they are small, round, sweet and tasty. We’re also using more locally grown salad greens and spinach in the fall, and the spring and summer crops of green beans, eggplant and corn (just to name a few) will bring plenty of flavor. Our use of seasonal ingredients will continue to increase – in fact, this past summer at least 1/4 of our produce came from local farms and we expect to increase that amount to 3/4 over the next year. We’ll keep you posted, and in the mean time, please let us know what you think. Bart Ortiz, Vice President of Flavor & Consistency, would like to know if not serving tomatoes in the winter (when they taste like cardboard) is o.k. Feel free to share your thoughts with him by e-mailing bortiz@qwrh.com. If you’ve visited our Cary Lucky 32 you’ve seen Raleigh artists Matt McConnell and Mack Farrior’s handiwork on our light diffusers and “tulips.” We’re so pleased with the warm glow of their innovative designs that we’ve commissioned Mr. McConnell and Mr. Farrior to custom-design sculptural lighting for all our Lucky 32 restaurants. This photograph doesn’t do their work justice, so please come by and take a gander. At our Raleigh Lucky 32, we’ve refurbished the terrace and gardens just in time for the cooler weather that makes outdoor dining such a pleasure. Like the Postal Service, neither rain, nor sleet nor snow will interrupt our service because we now have heaters and attractive weather resistant awnings and side curtains to protect you from the elements on rainy days (well, maybe the snow and sleet would put a damper on things). Folks dining outdoors in Winston-Salem will soon notice a difference in our new garden and expanded outdoor seating – we’ll have more tables overlooking the courtyard of Stratford Place. And, the next time you visit our Greensboro Lucky 32, check out the new mural in the foyer, created by local artist Chip Holton. It’s a clever piece that depicts Greensboro’s rich heritage. Our menus are feeling the winds of change, too. We’ve decided to make some of our most popular featured dishes permanent fixtures on our menus, and we’re bringing back some old favorites that we haven’t served in years. Creole Crab Cakes, Jambalaya Style Pasta, Mrs. Robinson’s Grill (chicken grilled with par-sley sage rose-ma-ry and thyme) and others will bring back fond memories for our long-time guests and we’ll bet they’ll be favorites for some of our new neighbors, too. Our Featured Selections can now be found on the center panel of the menu so you can see at a glance what the current “specials” are. We think the revamped graphics and design make it easier to find exactly what you’re looking for, whether you’re hankering for a favorite stand-by or looking for a new flavor. And, speaking of flavors, we think you’ll especially enjoy ours now that we’re cooking with more seasonal, locally produced foods. 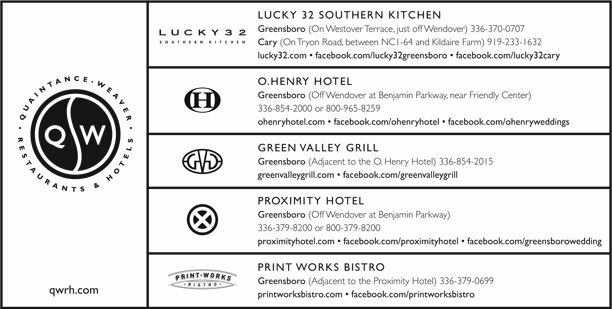 Our new “Get Lucky & Go” take-out /curb services are now in place at all our L32 restaurants. This service is quickly becoming a favorite resource for many families. Get Lucky & Go also comes in handy for picnics, tailgate parties and business lunches. Give us a call to place your order, pull into a designated parking place and we’ll bring your order to your car. Our services include boxed lunches, family dinners and “Heat & Eat” selections that can be prepared in our kitchens and cooked in yours. We even have one-stop wines at value prices. For more information about our Get Lucky & Go services, including menus, visit our website at lucky32.com, or give us a call. We have a lot of fun finding new ways to bring our guests flavor, comfort, value and convenience with friendly, competent service. I hope you’ll let us know how we’re doing. Call, visit or drop me (Dennis) a line atdq@qwrh.com.